A few weeks ago I received an email from Cathy that owns In Stitches in Rushville, Indiana. 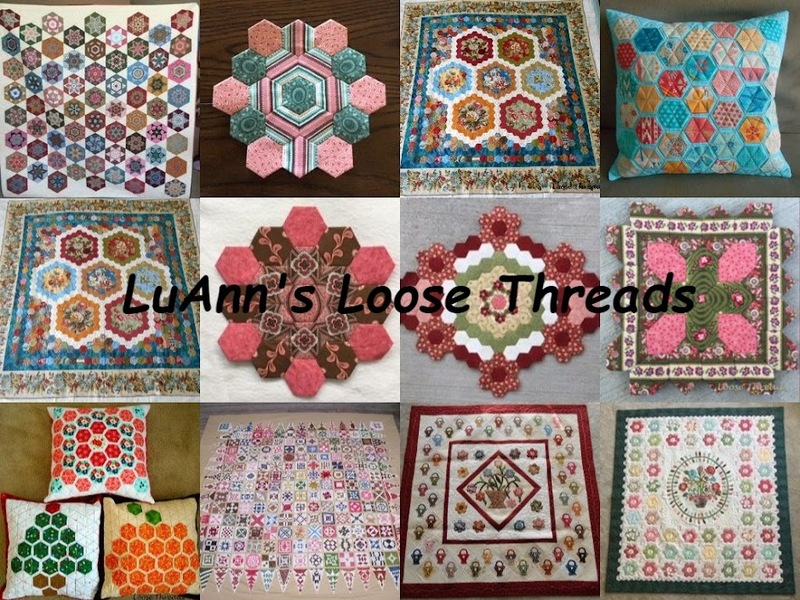 She had been reading my blog and wanted permission to use my pattern for From Squares to an On Point Quilt to hand out to customers during the Stars Over Indiana Shop Hop from June 12-20. Here is another link to a different version of the pattern. And yet another version where I controlled the setting triangles and center square. I've added the links to my sidebar. I made the quilt top below, and drove out to Rushville, Indiana, to meet Cathy and visit her shop. I know it helps to have a lot of samples made from a pattern so you can visualize what it will look like. I also took this little quilt that I had made from the same pattern. I asked Cathy if I could take some photos in her shop to post on my blog so all of you can see some of the neat things she has there. She has lots of samples hanging all over the shop. In Stitches has lots of pre cuts including these charm packs. These are just some of the charm packs. Others are scattered over the shop. There are lots of different jelly rolls. Here are some, but there are others. I love to see a bed in a quilt shop. Cute display! I was drawn in by this display. I love decorating for Halloween and bought the panel you see displayed plus a few other pieces. There is a wall of beautiful batiks. Here you see more panels on display. Here are small quilts made for each holiday. There is a huge display of fat quarters. This is one of the samples that Cathy made from my pattern. She did this one using candy squares to make a cute table topper. It was nice to meet Cathy and to see her shop. I'm flattered that she wanted to use my pattern! The eagle has landed, and I've finished my version of the Ohio Collection quilt top. My quilt top measures 74"X 93". Most of my blocks are based on the Ohio Collection book by Anita Shackleford. Other blocks and ideas came from Album Quilts of Ohio's Miami Valley by Sue Cummings. I finished the last 3 blocks last week. My eagle is based on one I found in EQ5. I made his wings two colored, and I used the shield from Anita's book. I copied the shield onto foundation piecing paper, and paper pieced it using binding around the bottom part. It was fun and challenging doing this quilt along with Karen, Lori, Cathy and Nancy. I think all of us working on their blocks at the same time helped to keep me motivated. In a couple of days, I'll tell you about our next group project. Maybe you'll want to join us! Monday was our monthly meeting of the English Paper Piecing Addiction Group at Back Door Quilts in Greenwood. We always have lots of fun, and everyone leaves feeling inspired. I'm not good with names and don't know the maker of this beautiful Lucy Boston Patchwork of the Crosses block. She also brought this antique butterfly quilt to show. We are always happy to see anything quilt related. I wasn't quite fast enough to get photos of these tiny hexagon blocks for Stars in the Garden. Here is a cute bag done in wool applique. Becky showed us a gorgeous bright quilt. She said this is only her second attempt at machine quilting. She did a great job! Sandy is working on one of Sue Daley's patterns. This is just beautiful. Wish I had gotten a better photo. This quilt is called Labyrinth. I love the fall colors in this one. Here is the one hanging in the shop done in beautiful batiks. You can purchase the pattern from Back Door. This is a shop sample, too. I'm not sure who made it, but it is a new pattern that the girls found at market. This little basket quilt is just adorable. The basket is pieced, and the handles are embroidered. Linda (I think) is making this one in Sue Daley fabrics. These baskets are just too cute. The pattern is by Brandywine Designs and will be in the shop soon. They will also have the basket template from paper pieces.com. When Linda and Teri were at market, Sue Daley asked if they would like to bring a couple of her quilts back to display in the shop. Here is one of them. This pattern of Sue's is Antique Sampler. And, here's a closer look. Fruit Tingles is a new Sue Daley pattern. Marilyn has been doing some beautiful machine embroidery. Here is another one. I just love the flowers. One of the girls (that will remain nameless) showed us her sewing bag. I thought I'd leave you laughing. I'm beginning to put my Ohio Collection blocks together. I still have a couple of blocks to complete plus some filler blocks, and then the quilt top will be complete. My supervisor, Tiki, approves of the blocks so far. I can see that the end is in sight, so I've completed quite a few blocks this week. There are too many to fit on my design wall now. I English paper pieced this LeMoyne star before and decided that I'd go ahead and applique' it to a piece of background and try to fit it in the quilt. This one is called Spice Pink. I spent yesterday afternoon on the porch doing the applique' centers. Old Tom was done before, and I embroidered his eyes and nose on yesterday afternoon. I used a tutorial for embroidering berries from Karen at Faeries And Fibres Blog. She has some really nice tutorials on her blog that you should check out. I like the face on Old Tom even if he does have kind of a "people nose". Karen, Nancy, and Cathy have completed their quilt tops. Lori and I are close! I've missed my English Paper Piecing, so I've started a new hexagon project using some bright hexagons from a project that I started awhile ago. I've added more hexagons to those. And, you can see the squares I have cut to do even more. I'm not exactly sure where this project is going, but I have some ideas. More on that in another post. The weather here has been just beautiful. I hope you are finding some time to sit outside and do a bit of stitching.